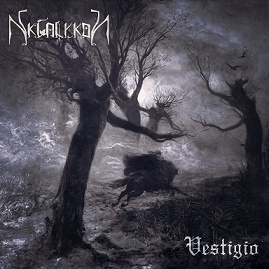 Skialykon are a solo project from Italy that plays an atmospheric form of black metal and this is a review of his 2015 "Vesigio" which will be released on July 24th by Naturmacht Productions. A very dark and atmospheric ambient synth sound starts off the album and after the intro the music remains atmospheric while also adding in more of a heavy and melodic sound along with soem grim and high pitched screams and a great portion of t he tracks a re also very long and epic in length. Clean signing and chanting can also be heard in certain sections of the recording and when solos and leads are utilized they remain true to a modern and melodic style of atmospheric black metal and some of the grim also have a depressive feeling to them at times and all of the musicla instruments have a powerful sound to them. Spoken word parts are brought onto the recording in some songs as the album progresses and when acoustic guitars are utilized they bring elements of folk music onto the recording and some of the tracks also bring in the sounds of nature and all of the tracks stick to either a slow or mid paced musical direction while there is also a brief use of blast beats and fast playing and the album closes with an instrumental. Skialykon creates a style of ambient black metal that is very modern, melodic and atmospheric while also having more of a guitar driven sound and some structures that where more common with some of the mid 90's epic black metal bands, the production sounds very dark, raw and heavy while the lyrics are written in Italian and cover paganism, old beliefs and representations of nature. In my opinion Skialykon are a very great sounding atmospheric, ambient black metal project and if you are a fan of this musical genre, you should check out this album. RECOMMENDED TRACKS INCLUDE "Suanator Celeste" "Skotadi" and "Katharsis". 8 out of 10.